The Applied Promising Practices (APP) initiative supports the identification, implementation, and evaluation of child and family practices that are supported by both academic research and first-hand knowledge and experience. This ongoing work reflects The Federation’s commitment to innovation, research, and service quality. A “promising practice” is an activity, strategy, service, or program that shows effectiveness in small-scale interventions and has the potential to inform and improve service delivery on a larger scale. These examples are identified and supported by a community of practice, led and supported by The Federation. These APP teams collect practice-based knowledge, academic research, and quickly develop and distribute a framework for expanding these successful interventions across the province. Increase the adoption and integration of promising practices in community social services organizations through the timely distribution of emerging knowledge to front line practitioners and program leaders. The Applied Promising Practices (APP) initiative was launched in 2008 through a partnership between The Federation and the Canadian Outcomes Research Institute (CORI) with funding from Human Resources Social Development Canada (HRSDC). The goal was to enable practitioners and managers in community agencies to look more closely at practices that they believed were making a positive difference in the lives of people they served. We first invited practitioners to identify new practices that were working (or could work if more systematically implemented). We then encouraged them to find other practitioners and agencies in their geographic area or field of interest to join with them in this inquiry. Four groups emerged and launched APP projects with support from The Federation. A group of five agencies in BC’s Lower Mainland came together to evaluate youth hubs and integrated sites. A southern Vancouver Island group pulled together six agencies to look at family preservation and support (and then specifically investigated different clinical supervision models for family preservation staff). A group comprised of five agencies from the Interior and Northern BC looked at staffed residential care for youth focusing initially on intake practices. Seven agencies in the Upper Fraser area looked at practices within Family Resource Programs that supported early childhood development. This work resulted in the Early Childhood Development APP Report. Each group was supported by a facilitator/researcher from the Federation/CORI team. This person assisted the group in identifying promising practices, collecting relevant academic research evidence, developing a plan for implementing or scaling up the promising practice, evaluating the outcomes, and sharing the findings. 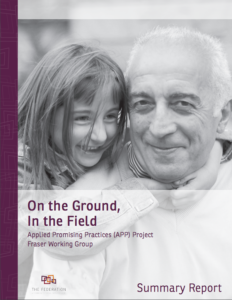 Based on the success of early APP projects in 2013, The Federation began work with the Ministry of Children and Family Development’s Applied Practice Research & Learning Branch to develop a standard Applied Promising Practices Toolkit. In 2014/15, the Ministry and The Federation set out to pilot the toolkit with four new APP projects. In the summer of 2014, MCFD and The Federation initiated the APP Toolkit Pilot Project, in which four promising practices were selected from within the province in order to assess the efficacy of the APP Toolkit prior to promoting it more broadly across MCFD and the social services sector. Based on the success of these pilots MCFD, APP projects have continued to be developed and undertaken within the Ministry.